7km of unspoilt beach just steps from your garden gate - and no traffic! Sueño del Mar is our heavenly holiday home overlooking the Atlantic ocean. A few seconds' stroll to 7km of unspoilt sandy beaches with cafes and restaurants dotted along - but not close enough to hear or see! In the apartment, you can't see or hear traffic - it is surrounded by beautifully maintained gardens and leisure facilities for you to enjoy. All that separates us from the beach is a delightful footpath/cyclepath that curves the whole 7km along the seafront. Sueño del Mar is quiet but not isolated, however if you want wild nightlife - forget it! There is a massive swimming pool and kids' pool (summer only), with numerous sun loungers and showers, play area and tennis courts. Isla Canela Golf course is only 2km away. The charming market town of Ayamonte is 6km away for all your requirements - 2km in the other direction is the delightful and quaint fishing village of Punta del Moral. There's a supermarket for all the basics a short stroll away from the apartment...and bigger supermarkets in Ayamonte. We have a dedicated underground parking space. While Isla Canela has grown over the years into a low-key, laid-back, (very Spanish) holiday area, there are still huge stretches of wildlife wetlands and rivers all around. Our apartment: The main bedroom has French doors opening onto a terrace overlooking the sea - you can lie in bed and watch the waves. It has one double bed with an en-suite bathroom containing bath-with-shower, toilet and bidet. The second bedroom has two single beds (which can be securely joined to make a superking-size bed for a second couple). There is also a third foam mattress + bedding for occasional use or for a child... and an inflatable mattress. (Cot and high chair are available on request.) There is a separate shower room with toilet and basin. Our modern kitchen has everything you would expect including hob, oven/grill, dishwasher, large fridge/freezer, microwave, and washing machine. The sitting room has French doors onto a large sea-view terrace - dine indoors or out! There is a large flat-screen TV and the wifi is free. The apartment has air-conditioning/heating but please use sparingly as it is not good for the environment...and is expensive! The area is friendly, and you are spoilt for choice with local fiestas and events, watersports, walking, etc. Faro airport is just 50 minutes away by motorway and Seville is 90 minutes in the other direction. This part of southern Spain is largely undiscovered and is characterised by dramatically lovely national parks, unspoilt coastlines, charming towns, wonderful seafood and glorious weather, with gentle breezes. Temperatures typically range from 35c+ in August to 12-18c at Christmas. A visit to Sueño del Mar could be your best, most relaxing holiday ever! Please note air-conditioning will be installed shortly. english, french, german, I'm learning Spanish! A LITTLE French & German! Hi everyone! I live with my partner John and scruffy dogs Tiggy and Alfie in the delightful little market town of Nantwich in Cheshire. I run my own business so I'm fortunate to be able to come to Spain whenever I want!! This is my first venture into Spanish holiday home ownership and I would love our guests to adore Isla Canela and the surrounding countryside as much as we do. I'm looking forward to giving you a fabulous and relaxing holiday. I'm learning Spanish and have discovered that the locals really appreciate it if you try just a few words! They're very encouraging! I don't run Sueño del Mar as a cold commercial operation...and we always try to treat our guests as friends. Sueño del Mar is fabulously located right next to an unspoilt 7km beach...within sight and sound of the waves. It is comfortable, convenient (approx 90 m square), beautifully maintained and furnished. It's very quiet and yet within a short stroll down the coastal path for a cycle or drive into Ayamonte or Punta Del Moral for more requisites. Two bedrooms, two bathrooms and (very valuable!) an underground parking space! A relaxing holiday in authentic seaside undiscovered Spain - very few British, no fish-and-chips, no tat. The Costa de la Luz means coast of light - you will see why it is called that when you arrive. Wonderful dawns and wonderful sunsets. The apartment is yards from a 7km stretch of unspoilt sandy beach where you can watch fishing boats, kite-surfers and local cockle-fishers plying their traditional skills in the sand. Fall asleep and wake up to the sound of the waves and the breeze in the palm trees. And if you can't walk quite that far, there's always the massive pool (summer only), tennis courts, kids' play area and golf course (1.5km away). Help yourself! It's set to a quick cycle called 30@30 which means half an hour at 30 degrees. it's more than enough for holiday washing. No beach towels - please bring your own! Our apartment is technically on the ground floor but is actually about 2 meters above the garden! Cream leather 2-seater sofa - v comfy. Huge matching armchair. Semi-rocker chair to match. What can you say? it toasts bread. Flat-screen TV. European channels and BBC News only. For free UK TV, bring HDMI cable to link YOUR PC to our TV. If you are on Mac, we have the appropriate cable here. Full details on booking. A small selection of books - growing all the time! Gets sun most of the day.....lovely shade in the evening! Private to residents of Las Arenas. You are welcome to use. 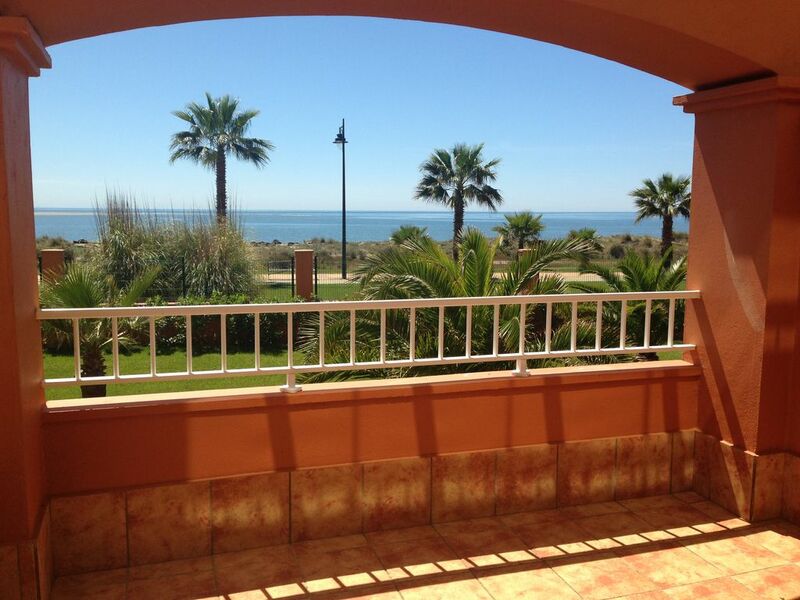 Isla Canela Golf Course and hotel is approx 1.5km away. A wonderful stay at Sueño del Mar! Imagine jetting away from a cold December in Britain, to 22 degrees of sunshine...walking along an almost deserted beach...and watching incredibly beautiful sunsets every night - very special memories! Great location on the beach. Quiet and relaxing. Ayamonte is a lovely little town with places to eat and coffee shops in abundance. We enjoyed that corner of Spain and a couple of trips into Portugal. Thank you Keir...I was delighted to welcome you! Is it a charming and quiet corner of Spain...though it becomes (a bit) more lively in July and August when families come down for the wonderful beaches. Lovely place, great weather, very relaxing. Thank you so much Michael...I'm delighted you had a good time and thank you for the review! I stayed in this apartment last year, and vowed to return - and I have done. I had a great fortnight there from late October into November. They weren't many other people in the block, but the beach bars were open (and wonderful) and the weather was perfect - about 70-degrees F all the time. The picture you see looking out over the balcony here is exactly what you see from your bed every morning as you wake. The owner has made some small improvements to the flat, mostly in terms of decor, but what was a small shower is now about three times the size and is a great improvement. I went into Ayamonte (gorgeous small town three miles away) most days for coffee and breakfast (English newspapers are available all year round if you're a print and paper addict, as I am). I also explored Castro Marim on the road to Villa Real De Saint Antonio (just over the border in Portugal); the interactive display in the visitor centre is terrific, and the Moorish water gardens below it are a delight. I love driving due north on the excellent country roads either side of the border, and just exploring - and having a beer in any of the villages along the way. In short, I can't recommend this part of the world, and this apartment, too highly. Yet again I can honestly say that I'll be back. Hi Steven, I'm so glad you liked the improvements I made to Sueño del Mar - the shower is terrific now! Thank you for your review. Schönes Appartement direkt am endlosen Sandstrand. Sehr nette Vermieterin. Mitten im spanischen Leben. Ich danke dir sehr. Ich bin sehr glücklich, dass Sie sich willkommen gefühlt haben. Merryn! This apartment is fantastic - clean, airy, modern and very nicely furnished with sensational views of the sea only 50m away. The pool wasn't open when we were there but it looks great...and huge!! Best of all, there's no traffic noise - and no traffic to spoil the view. Beds are very comfortable. Restaurants within walking distance. Everything you could need for a great time, whether you want to explore, go sailing, play golf....or just relax on the big terrace with a cool beer. Highly recommended! Hi Tom, I'm so glad you and Julie had a great time...it was a pleasure welcoming you to Sueño del Mar - please come again! This is a beautiful and largely undiscovered part of Andalusia - largely agricultural with pretty towns and villages...with the bright lights of the Portuguese Algarve a short drive over the border. Isla Canela may be a purpose-built seaside resort but it is very low-key and tranquil. Obviously it gets a bit livelier in July and August - but this is relative! Local beachfront bars and restaurants are a short walk away! Plaza Laguna in Ayamonte is where events are held on a Friday night. Don't miss Ayamonte fish and produce market, daily - but mornings only. Watersports galore....or just stroll along the never-ending beach. Most shops and restaurants (but not all) in Isla Canela close up in the winter months...but Ayamonte is only 5 or so km away with full shops, bars and restaurants.